Interactive restaurant reservation system for your website. Created and fully supported by PHPjabbers & Stivasoft, the restaurant booking system provides a self-serviced booking system for your website and powerful availability management tools. These are few of the features supported by the restaurant booking system 2.0. You can see all features, test the system interface and try all admin options at PHPjabbers.com ? a fully featured demo is available for you. Requirements: PHP 5.1 or greater and MySQL 5.1 or greater. Release Notes: Improved UI, based on PHPjabbers Framework 4.0. Responsive front-end, multilanguage, system backup, user role based admin, etc. 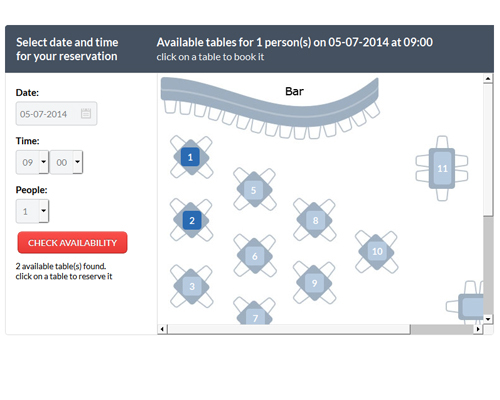 You can be the first to write a review of Restaurant Table Booking System!